This cover went into the mail in Hamburg and received a Hamburg CDS. The sender requested routing Via Liverpool on its way to its destination of Antofagasta, Peru. The sender also placed a neat handstamp boxed return address on the rear. 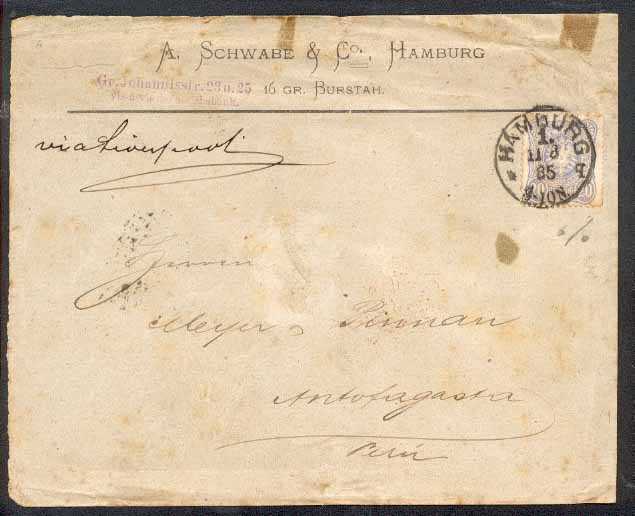 The sender also used a handstamp on the front to give another return address. and about 1100 km north of Santiago in present-day Chile. to be the 24th parallel south, that was an error at this time. was fought over control of the rich nitrate deposits in the Antofagasta province. Also at issue was Bolivian access to the Pacific. In 1885, Antofagasta was occupied by Chile who had won the war handily. A plan for resolving the border dispute was included in the Treaty of Ancón in 1883. But the planned actions were not completed. It was not until 1929 that the Treaty of Lima resolved some of the open issues. The United States arbitrated in the negotiation of that treaty. Even today there are ongoing border disputes in this region. which lost its access to the sea as a result of the War of the Pacific. 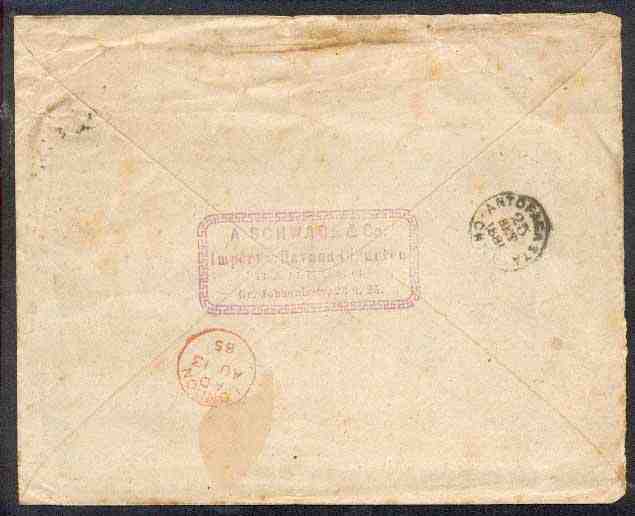 The cover was backstamped as it passed through London on August 13. It arrived in Antofagasta on September 25. Imperial Eagle issued in 1880-83 (Scott 40).